Now a viewing audience can see exactly what a reporter sees. Kimberly Sauceda from Looxcie demonstrated to me at the CES digital experience event a wearable video cam device that connects to a smartphone via Bluetooth which can relay (retransmit) the live video and audio signal to a viewing audience. The Looxcie video cam comes with a bendable earloop that holds it so it points where you are looking. 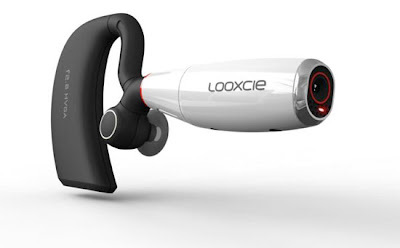 The Looxcie includes a stability feature that keeps the video level while you are streaming video. The smartphone (such as an Android or iPhone) application includes a viewfinder so you can see what your Looxcie is capturing. It includes an instant clip feature that allows you to replay the last 30 seconds of viewed content. This can be important if you had not initiated the Bluetooth connection and some amazing event happened. The Looxie weighs approximately 1 oz., has a battery life of 4 hours of continuous video cam, and can capture at 15 frames per second HVGA-quality video.